A valid credit card must be presented upon arrival, along with a valid ID that matches the credit card presented. DOES THE REFINERY HOTEL TAKE CREDIT CARDS? Debit and credit cards* will be authorized at check-in for the entire amount of your stay, plus $150 per day to cover incidentals. The system will hold the funds until check out, at which time the amount actually incurred during the stay will be charged. The original authorization amounts may take up to 30 days after departure to be released by your bank or financial institution and the hotel will not be responsible for any resulting fees or charges. *The hotel does not accept prepaid card. 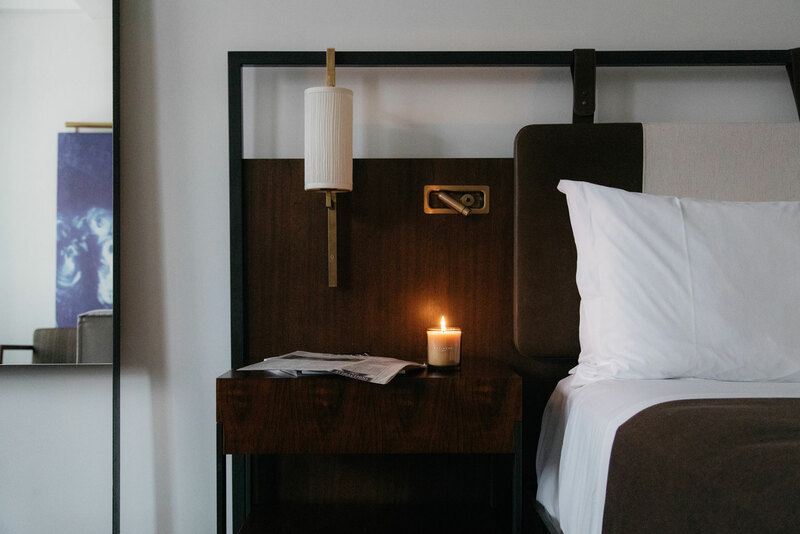 WHAT TIME IS CHECK-IN & CHECK-OUT AT THE REFINERY HOTEL? You may check in at 3:00 PM. Check out is at 12:00 PM. WHAT IS THE HOTEL'S Early Arrival / Late Departure Policy? We understand plans change and will do our very best to accommodate you. For early arrivals prior to 11am, there will be a (1) night's stay plus tax charge. For early departures, there will be a (1) night's stay plus tax charge. For late departure after 5pm, there will be a (1) night's stay plus tax charge. WHAT IS THE MINIMUM Age TO CHECK-IN AT THE REFINERY HOTEL? Guests must be at least 21 years of age to check in at Refinery Hotel. All other guests must be accompanied by a responsible adult. The hotel's 48-hour standard cancellation policy allows cancellation by 3 P.M. 2 days prior to arrival with no penalty. After this time, the credit card on file will be charged the first night's room rate plus taxes & fees. In the event you change your plans, you must cancel or change your hotel reservation in accordance with the hotel's cancellation policy to avoid penalties. If the reservation is non-refundable, no modification or cancellation will be granted. WHAT IS THE Smoking Policy AT THE REFINERY HOTEL? We are a non-smoking hotel. Penalty for smoking is a non-refundable charge of $500. IS THE HOTEL PET FRIENDLY FOR DOGS & CATS? We're so happy you and your furry friend have chosen to stay with us. Pets under 40 lbs are welcome and there is no pet fee. Housekeeping services for rooms with pets require pet owner be present or pet must be crated. An authorization of $200 will be applied up arrival in case pet accident/ damages. WHERE IS THE REFINERY HOTEL LOCATED IN NEW YORK CITY? Refinery Hotel is located at 63 West 38th Street, between 5th Avenue and 6th Avenue. DOES THE REFINERY HOTELOFFER VALET PARKING? *Only valid for 24 hours parking per night of reservation. DOES THE REFINERY HOTEL OFFER ANY Airport Shuttle SERVICE? DOES THE HOTEL HAVE A GYM OR Fitness Center? Fitness Center opens daily from 6:30am to 7:30pm and is located on the second floor of our hotel, which includes state-of-the-art fitness bikes, treadmills, free weights, and weight machines. CAN GUESTS SEND POSTAGE SERVICE & Packages to the REFINERY HOTEL? We accept packages that are sent to the hotel, addressed to the first and last name on the reservation (with confirmation number). Packages will be stored in our package room up to 90 days after guest departure. IS THERE STORAGE FOR Luggage AT THE REFINERY HOTEL BEFORE OR AFTER MY STAY? Luggage can be stored on premises while rooms are being prepared, and after checkout until 9PM. WHAT IS Stay Wanderful reward program? DOES THE HOTEL OFFER GUESTS ANY REWARDS PROGRAM?